The governor says now that Mainers must be at least 21 to buy tobacco products, there isn't a clear-cut definition of who is a legal adult. WATERVILLE — Gov. Paul LePage said Monday that he’ll seek flexibility from the Trump administration in an attempt to bring consistency to the age thresholds at which people can drink alcohol, buy tobacco products, serve in the military and vote. LePage, a former mayor of Waterville, touched on those issues during a wide-ranging discussion Monday with about 20 members of the Waterville Rotary Club at the Educare Central Maine facility. He said previously that he will introduce a bill to raise the voting age to 21 and the age for military service to 21 in response to the passage of a state law that raises the minimum age for someone to buy tobacco products from 18 to 21. The 26th Amendment to the U.S. Constitution says all citizens 18 and older can vote. Gov. Paul LePage speaks on a wide range of topics during a Waterville Rotary Club luncheon on Monday. During his exchange with audience members, LePage also challenged the scientific consensus that human activity is the main driver of climate change, saying he has not seen evidence that convinced him of it. The Republican governor also addressed the opioid crisis in Maine, saying the state needs to focus more on prevention and law enforcement rather than on recovery. But House and Senate lawmakers easily overturned that veto in a special session this month. 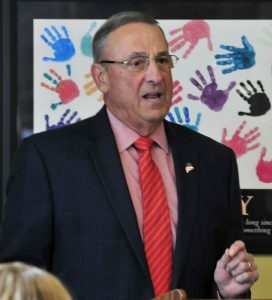 Even as LePage suggested he’d try to raise the voting and military service ages, he also suggested another tactic might be to push to lower the drinking age from 21 to 18. When asked by an audience member how this would affect drinking laws in the state, LePage pointed out that there is no federal law requiring states to have the drinking age be 21. The National Minimum Drinking Age Act of 1984 asked all states to raise their minimum age to purchase and possess alcohol to 21, and states that did not comply faced a reduction in highway funds under the Federal Highway Aid Act. LePage said he is drafting a memo to send to President Trump asking him to amend the decision on federal money being withheld. When asked if a lowered drinking age would result in more driving deaths, LePage quickly countered that distracted driving – primarily drivers who are texting on cellphones – leads to more deaths than drinking and driving. The governor then turned the discussion to “nips” – the miniature liquor bottles that have become increasingly popular for retailers. LePage said the 50-milliliter bottles litter roadsides and are easy to hide, so they are increasingly making their way into schools. “Let’s get them off the market,” he said. LePage has been working to have Maine’s liquor commission end sales, despite concerns that it may end up costing the state tens of millions of dollars in revenues and affect jobs at a Lewiston distillery. The Maine liquor commission recently decided to raise the price on 778 products sold in state-sanctioned agency liquor stores, including “nips,” which will go from 99 cents to $1.49 starting Oct. 1. LePage said he has been working with experts on ways to deal with people addicted to heroin and other drugs, but that the only thing the Legislature would deal with is treatment, not prevention or law enforcement. He said that even after an overdose, a person could just leave the hospital and go get more drugs. He said he’s trying to change the law so that a person who overdoses has two options: incarceration or treatment. “This Legislature refuses to do anything,” he said. “How much is created by man is unclear,” he said. During the discussion Monday, LePage said in order to stop younger people from leaving the state, he’d like to see a program where students can get interest-free loans for college by agreeing to stay and work in Maine. He said many people leave for higher wages and better jobs out of state, noting that his son had left Maine to work in Florida because of the wages. “I can’t blame him,” LePage said.